Published Dec 11, 2017 by Addison-Wesley Professional. 2.2 What is the Java Platform Module System (JPMS)? 4.1 What is a REPL and what does it give us? Java 9 introduces new features and functions that will make your code simpler and easier to read and will make for better deployment and documentation as well. There are also a number of changes, however, that might have unexpected consequences for your applications. This video covers the advantages of Java 9 and how to manage risks when migrating an application to this version. 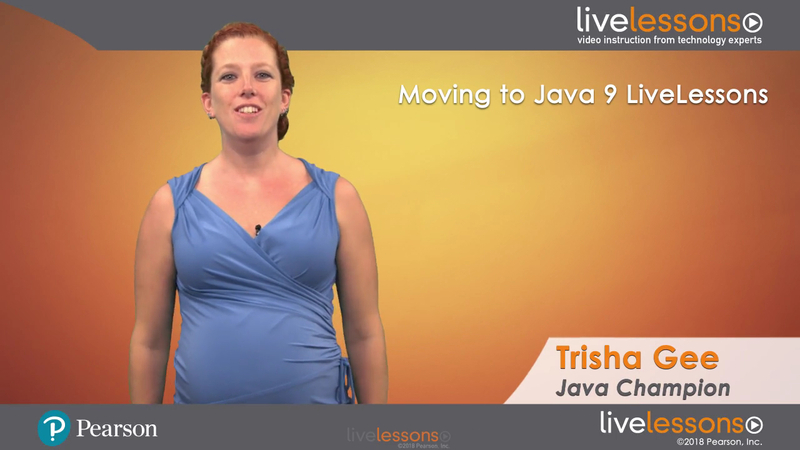 After quickly showing how to check your existing Java 8 code for compatibility before switching to Java 9, Trisha then reviews how Java 9 Modules work, what they are, why you might use them, and how to make your applications modular. In this training, she also covers what Reactive Streams are and how and where to use them, before moving on to look at JShell, the Java REPL. Better performance of secure applications, locking, and graphics. The code for this training can be found at https://github.com/trishagee/sense-nine. Java developers who are working on an existing system. From a technical point of view, this is suitable for developers working with Java every day, but senior/lead developers and architects will find this talk useful to decide whether to apply these changes in their applications, and to provide guidance to the rest of their teams. In this lesson, you look at what you can do to prepare your application for Java 9 without even having to use it. You look at which compiler warnings in Java 8 should be addressed and how to fix them. You see how to use the jdeps tool to find code that needs to be updated before you can use Java 9. You also step through an example of compiling a project in Java 9 that hasn't been through these steps to see what kind of problems you might face. Project Jigsaw and Java Modularity are the big ticket items for Java 9, so in this lesson you take a look at what these are. First, you find out what Project Jigsaw is and how this differs from the Java Platform Module System. Next, you walk through a simple example of creating a modular application, and you use the link tool to create a very small image of Java and our application. Then you migrate an existing application to use the Java Module System. You see how visualizing dependencies and modules can help you to better understand the design, and finally wrap up the lesson with a summary of the advantages and disadvantages of migrating to using JPMS. This latest version of Java comes with the Reactive Streams API as part of the language, so first you need to understand what this is and what it means. You take a look at how your existing application could benefit from using the Reactive Streams API and show how to use it in your architecture. You then use two different Reactive libraries within your application to see what you can do with Reactive Programming. Finally, you explore how Reactive Streams are different from Java 8 Streams. A Read Eval Print Loop for Java is a new way of working, so you need to understand what a REPL is and what it provides. You also take a quick look at how the introduction of a REPL can change the way you work inside your IDE. In this lesson, you learn about the wide variety of small language changes in Java 9 that are going to help you. First, you have Convenience Factory Methods for Collections, then the small changes from Milling Project Coin. You play with two new methods on the Streams API, take a look at the new methods on Optional, and go through practical examples of using the new Stack Walking API and the updates to the Process API. In this lesson, you cover pretty much everything else in Java 9 you should be aware of that you haven't already looked at, including multi-release JAR files, the updated deprecation, updates to Javadoc, and other changes that might impact your application. 3.1 What is the Reactive Streams API?